The artist line up at Lazarides Rathbone is something like the squad at Barcelona. The best players in the World at the top of their game. This week, Lazarides commemorates ten years of exhibitions with a spectacular group show titled Still Here opening to the public on 12th February. The gallery owner and once upon a time photographer for Banksy, Steve Lazarides has come a long way. This celebration coincides with the announcement of a new investor, as well as a name and location change in the imminent future. 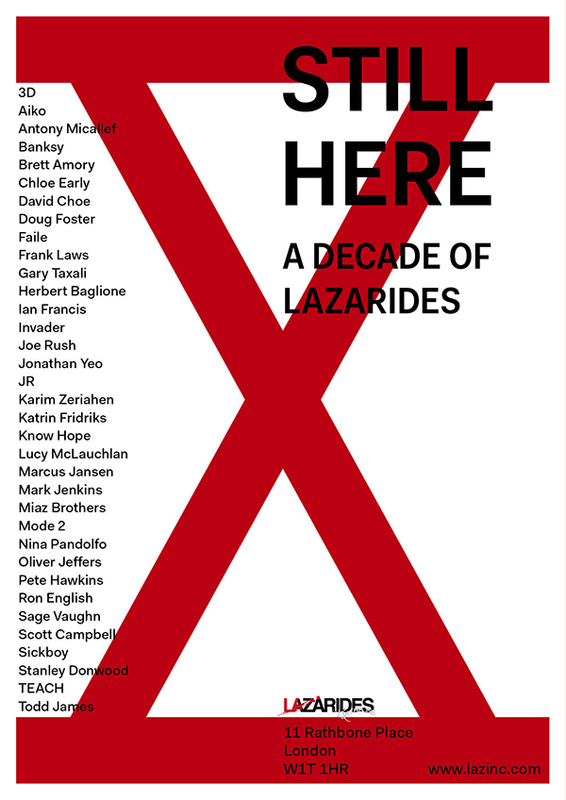 In February 2016, Lazarides will celebrate its 10th anniversary with a group exhibition from the gallery’s most celebrated and pioneering artists. For the landmark exhibition, the gallery has invited back those artists who have helped shape the gallery to take over their flagship space in the heart of London’s Fitzrovia. Visitors to the gallery will be invited to view unique originals across the three floors of at Lazarides Rathbone by over 30 artists significant to the gallery’s legacy: 3D, Aiko, Anthony Lister, Antony Micallef, Banksy, Brett Amory, Chloe Early, Doug Foster, Faile, Frank Laws, Gary Taxali, Herbert Baglione, Hush, Ian Francis, Invader, Joe Rush, Jonathan Yeo, JR, Karim Zeriahen, Katrin Fridriks, Know Hope, Lucy McLauchlan, Marcus Jansen, Mark Jenkins, Miaz Brothers, Mode 2, Nina Pandolfo, Oliver Jeffers, Pete Hawkins, Ron English, Sage Vaughn, Scott Campbell, Sickboy, Stanley Donwood, TEACH, Todd James, Vhils, Xenz and Zevs. These varied artists have formed the backbone of Lazarides’ mission, each challenging the norm of what is acceptable within the art world, simultaneously providing art that is free and accessible to an international public without discrimination. Over the last decade, Lazarides has assumed a pivotal role promoting those artists thriving outside the conventional contemporary art market. Since Steve Lazarides’ conception of Lazarides in 2006, the gallery has spanned international territories and undergone myriad transformations that echo its artists’ constantly evolving and progressing practice. 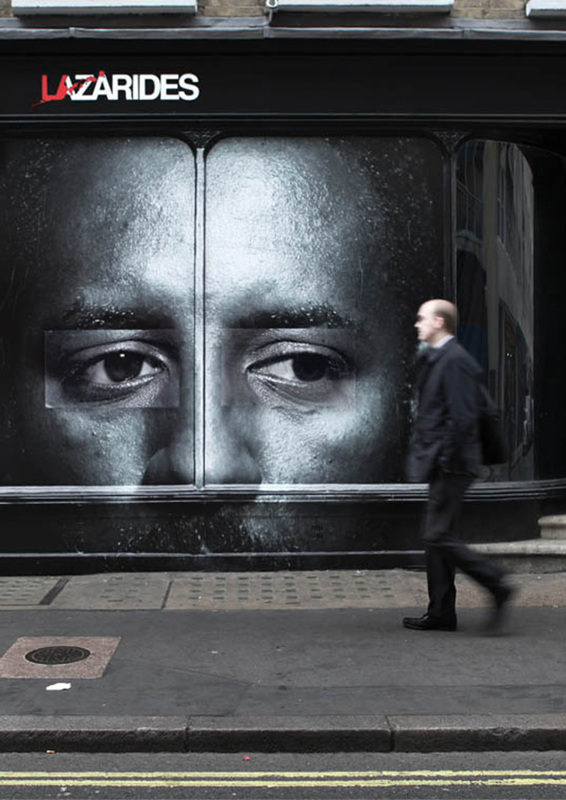 Since the inception of the gallery’s current space on Rathbone Place, Lazarides has hosted numerous, diverse exhibitions, including JR’s Crossing (2015) featuring his latest film ELLIS, and 3D’s Fire Sale (2013), a retrospective of imagery paying homage to Massive Attack’s visual history. Lazarides continues to be a forerunner in revolutionary off-site projects and immersive art experiences—from Los Angeles to New York, Frankfurt, Moscow and Istanbul—as well as taking part in art fairs and collaborating with museums, partner galleries, art fairs and private collection around the globe. My last visit to the gallery was to view Dumb Poetry by Lucas Price, which now seems like an absolute age ago. I look forward to celebrating this anniversary tonight with friends and give thanks to Steve for all he's done and wish him success with his new plans for the gallery.